Born into an entrepreneurial family with decades of fire and police service, the Sorensen brothers were destined to become both firefighters and the founders of Firehouse Subs. Now, nearly 20 years after opening their first restaurant, the brand has grown to more than 730 restaurants in 39 states and one U.S. territory, with even more ambitious expansion in the works. Featuring second-to-none sub sandwiches and a commitment to the communities they serve, Firehouse Subs is a daily affirmation that serving good food and doing good belong together. At headquarters, we like to call our growth a "controlled burn." Passing 730 locations, our expansion is carefully calculated to optimize potential, profitability, investment, and of course, our franchisees' success. Our plans show Firehouse Subs reaching 2,000 locations by 2020. As that's a fire with some serious heat, it's a good thing we were founded by firefighters. As one of the country's fastest growing restaurant brands, and a leader in the fast-casual sandwich industry, the demand for our uniquely prepared Specialty Subs is growing by leaps and bounds, opening up opportunities for expansion in new and existing markets. With our strong brand identity, exceptional franchisee relationships, and passionate executive team, Firehouse Subs is perfectly poised for development with the right investor. With an ever-growing history of innovative products, a focus on exceptional customer service, and a one-of-a-kind brand identity, Firehouse Subs is committed to building profitable businesses for franchisees and area representatives alike. Furthering our commitment, we offer extensive training programs and operating systems to help build your business. Our support team includes development and construction experts, training managers, field marketing managers, and seasoned operational managers -- all working together, streamlining operations for businesses that are simple to run. As former firefighters, we know all too well that to save a life, you must have the proper tools, gear, and knowledge. That's why we launched the Firehouse Subs Public Safety Foundation, to give back to the public safety entities in the communities we serve. Since its inception in 2005, the Foundation has donated well over $8 million in equipment and resources to Police, Fire, and EMS Departments across the country. We are dedicated to improving the life-saving capabilities of all emergency services, with funding, resources, and direct support to those who need it most. 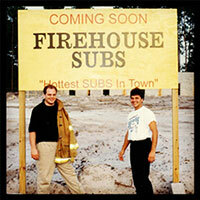 Looking for more information about opening a Firehouse Subs location in your area?